We are consistently surprised (and thrilled) by the creative fundraising efforts of others to support our orphanage project. As we have mentioned previously, The World’s Biggest Dinner Party idea was suggested to us by a very innovative Rotarian, Wayne Limbrick. If you read our newsletter, then you would also know about Elaine Godden from Cairns and her morning tea drop in center and her Friday night film nights that have raised funds for our project. Also, Rockhampton West Rotary member Trish Gilluley is following in the footsteps of Katie Trulson and completing a sponsored climb of Mt Kilimanjaro to raise funds and awareness for Umoja. We have to make a special mention of the Rotary Club of Elizabeth in South Australia. They recently ran a Karaoke for Kenya night—who isn’t a fan of a bit of creative alliteration? They collected a small entry fee to help purchase construction materials for our boundary fence, which the second group of volunteers will help to erect in Kenya this month. Thank you to everyone who organised this event and to those who came along to support Elizabeth Rotary Club and Umoja Orphanage Kenya. We hope you all had fun. There are many ways that you and your friends, family and colleagues can help us reach our goal of building our first children’s home in 2014. Perhaps your workplace has been considering supporting a charity? ask your boss if you and your colleagues could participate in a workplace giving campaign. So, let Umoja issue you a challenge: what creative fundraising idea can you think of to help raise money for our project? If in doubt, you can always host your own dinner party for our world record attempt on October 26th. 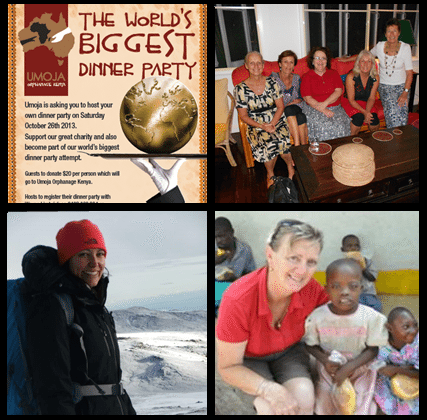 Visit http://umojahome.com/kenya/worlds-biggest-dinner-party/ for more info. Together we are truly achieving the extraordinary.